Its name is derived from two words of the local Wakhi language : 'Khun' means Blood and 'Jerav' means a creek coming from spring water/water falling. The Khunjerab Pass is the highest paved international border crossing in the world and the highest point on the Karakoram Highway. The roadway across the pass was completed in 1982, and has superseded the unpaved Mintaka and Kilik Passes as the primary passage across the Karakoram Range. The choice of Khunjerab Pass for Karakoram Highway was decided in 1966: China citing the fact that Mintaka would be more susceptible to air strikes recommended the steeper Khunjerab Pass instead. 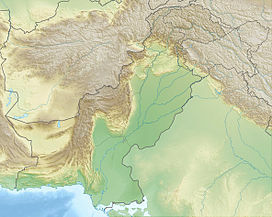 On the Pakistani - administered side, the pass is 42 km (26 mi) from the National Park station and checkpoint in Dih, 75 km (47 mi) from the customs and immigration post in Sost, 270 km (170 mi) from Gilgit, and 870 km (540 mi) from Islamabad. The long, relatively flat pass is often snow-covered during the winter season and as a consequence is generally closed for heavy vehicles from November 30 to May 1 and for all vehicles from December 30 to April 1. The reconstructed Karakoram Highway passes thru Khunjerab Pass. This is one of the international borders where left-hand traffic (Pakistan - administered Gilgit-Baltistan) changes to right-hand traffic (China) and vice versa. It has the highest ATM in the world on Pakistani side from the National Bank of Pakistan and 1LINK. In 2007, consultants were engaged to investigate the construction of a railway through this pass to connect China with transport in Pakistani-administered Gilgit-Baltistan. A feasibility study started in November 2009 for a line connecting Havelian 750 km (466 mi) away in Pakistan and Kashgar 350 km (217 mi) in Xinjiang. However no progress has been made thereafter and this project is also not part of the current CPEC plan. ^ "Khunjerab Pass". www.dangerousroads.org. Retrieved 2016-09-18. ^ Online Asia Times South Asia Feb 24, 2007. "China-Pakistan rail link on horizon." Syed Fazl-e-Haider. Wikimedia Commons has media related to Khunjerab Pass.